Most of the changes of the past few days involve seed differences. Unfortunately, none of that has changed yet for Marquette. I know some people have MU on the 2-line, but I just don't see it yet. Louisville and Wisconsin getting into the top-20 RPI would help, beating Georgetown would help even more, but teams like Missouri and Ohio State just have too many great wins to be upended by Marquette's good ones. Finally...my thoughts on the PAC-12 as a multi-bid league. Right now, I just don't see it. Washington and Arizona have a combined 1 top-50 win between them, and that was Arizona's win over another PAC-12 team, California. Even without bad losses, I just can't put teams in without some quality wins. 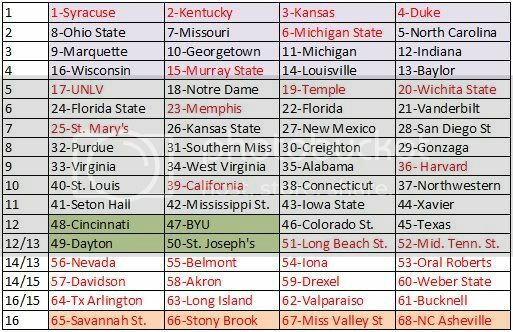 That's why I like Dayton and St. Joe's right now, because despite the bad losses, they both have three top-30 wins and have actually proven they can beat someone. Bottom line, yes, some PAC-12 teams have winning conference records, but if you do nothing in your non-conference and get 80% of your wins against sub-100 teams, you are more deserving of a bid to the NIT than the NCAAs.